St. Louis' never-say-die Billikens knocked the nation's No. 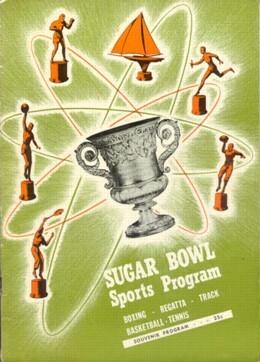 1 team off its perch as they wrecked Kentucky's Wildcats, 43-42, in the second game of the opening Sugar Bowl basketball doubleheader Friday night before a throng of about 7000 roaring fans at the Municipal Auditorium. Instead of the so-called "dream game" between the first and second-ranked teams in the country, Kentucky and Bradley, it will be an all-Missouri Valley Conference battle for the 1930 championship as the Billikens take on the Braves for the crown. Bradley connected for 20 out of 28 free-throw attempts in turning back Syracuse, 72-64, in the opening contest. Bradley maintained its perfect record by chalking up its 11th straight triumph and the Billikens handed coach Adolph Rupp's court thoroughbreds from the blue grass state their initial setback in seven starts in capturing the hair-raising overtime scorcher. The first half of the nightcap was bitter struggle with the lead changing hands 11 times and the score all square twice. The teams left the court at intermission tied 22-22. Starting off the third quarter, Fred Kovar put St. Louis in front swishing in a free throw, then the ferocious Wildcats did some telling damage. 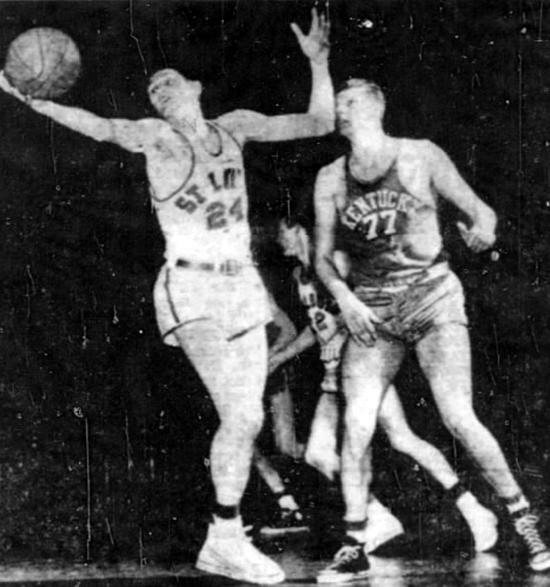 Stringbean Poll Bill Spivey made two free throws and a tap-in, the prodigious sophomore sensation Frank Ramsey made good with a rebound and hit the mark with a two-handed set, and Bobby Watson looped in a long set shot to give the Ruppmen a 37-28 bulge before the Billikens came back to life. Driving layups and crip shots by St. Louis captain Scott and Ray Steiner brought the Billikens abreast of the Wildcats midway in the final quarter. Then came two and a half minutes of dazzling basketball. After being fouled by Gardiner, Spivey missed a free throw but seconds later put the Wildcats ahead, 41-39, with a lay-up shot from underneath the basket. Schott hit with a one-hander in front of the goal to make it 41-41 until the gun sounded forcing the game into overtime. It looked mighty bleak for the Bills as three straight foul shots were missed by them right after the extra period opened. But Lillis later made an easy layup and the Bill led, 43-41. In a desperate attempt to steal the ball away from Kovar, Walter Hirsch batted it out of Fred's hands and was given two free shots when Kovar shoved him. Hirsch missed both. Spivey made one of his free throws after being fouled by Tom Lillis to make it 43-42. After coming perilously close to losing the battle the Bills froze the ball for the remaining minutes and 17 seconds to assure them of their second upset over Kentucky in Sugar Bowl competition. Kentucky plays Syracuse in the consolation contest Saturday night, starting at 7:45. . . .